“The Theory of Everything” tells the story of the marriage between the brilliant British physicist Stephen Hawking (Eddie Redmayne), and his wife, Jane (Felicity Jones). Stephen became a world-famous figure. Even though he is disabled by ALS, he is known for his perseverance and great mind. He is only able to speak with the assistance of an electronic device. “Theory of Everything” begins with Stephen as an undergraduate at Cambridge. He is an excellent student, but awkward and shy. Stephen meets Jane, and they begin to see one another. Over a period of time, Stephen begins to have serious physical symptoms, which impair his movement and walking. While in graduate school, Stephen is diagnosed with ALS and given a maximum of two years to live. He distances himself from Jane, thinking it would be unfair for her to stay with him after his grim diagnosis. However, Jane professes her love for Stephen, as well as her desire to stay with him for as long as he will live. If it’s only two years, so be it. “Theory of Everything” is a testament to the strength of the love between Stephen and Jane. Together they have three children. The screenplay, written by Anthony McCarten, is based on Jane Hawking’s memoir. Jane’s strength and courage bolster Stephen’s resolve. The movie also shows the emotional and physical toll on Jane from taking care of Stephen every day. In addition, Jane also has to be a mother to her children. In order to give her some relief from her demanding life, Jane’s mother suggests that she return to her church choir. She reasons that Jane had always enjoyed music, and this might give her an outlet. Jane does so. Jonathan, the choir director, is a widower. He becomes a friend of Jane, and then a frequent visitor in the Hawking home. Stephen likes him and allows him to help him and Jane around the house. Things get complicated with Jane becomes pregnant and has a child. Family and friends wonder whether Jonathan or Stephen is the father. One of the things I like about the movie is the theological discussion between Jane and Stephen. Jane is a practicing Christian, who regularly attends the Anglican Church. Stephen grew up in a family with no religious belief. At first he seems amused that Jane could be a believer. Yet, Stephen respects her faith and never ridicules her for her belief. They talk throughout the movie about faith and God. Even though Stephen is known for never embracing faith in God, the movie portrays him as one becomes respectful toward believers. At times he holds out some possibility that there might be a God. “The Theory of Everything” embraces religious discussion in a way that most movies resist. [Spoiler alert!] As strong as their love for one another is, it is not, unfortunately, enough to sustain their marriage. After many years, Stephen and Jane divorce, and both remarry. Because their love was a mutual source of strength for both of them, I was disappointed that it did not last a lifetime. According to Jane’s memoir, they continue to remain friends. The performances of Eddie Redmayne as Stephen and Felicity Jones as James are good bets to be recognized during award season. (They were both just nominated for Golden Globe Awards.) Redmayne, best known for his performance as Marius in the 2012 film of “Les Miserables,” fully embodies Stephen from the awkward young man who refuses to dance with Jane to a man confined in his wheel chair. At the end he communicates through his winning smile and raised eyebrow, talking through the electronic machine. It’s a remarkable performance. Jones is equally good as Jane. Jones’ role as Jane doesn’t require the physical demands of Redmayne’s performance, but she is passionate and strong. Later in the movie, you can see the exhaustion in her face and eyes. 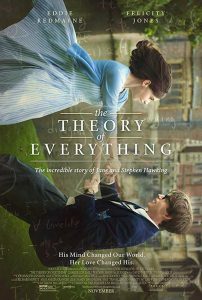 I recommend “The Theory of Everything.” It is a solid, well-written and very well acted movie about two gifted people and the love that sustains them over a period of decades.